Marietta Quadranau Mound, 39.425361 N., 81.461056 W.
Monuments mark the rise of civilizations world-wide. 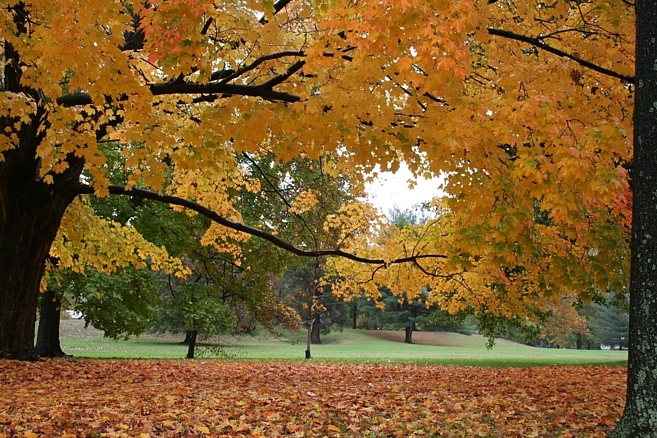 The earthen mounds of Eastern North America are part of a long-standing monument tradition. In the Americas, mound construction starts at an early date, well before the pyramids of Egypt were constructed. Watson Brake in northern Louisiana, dated from 5400 to ca. 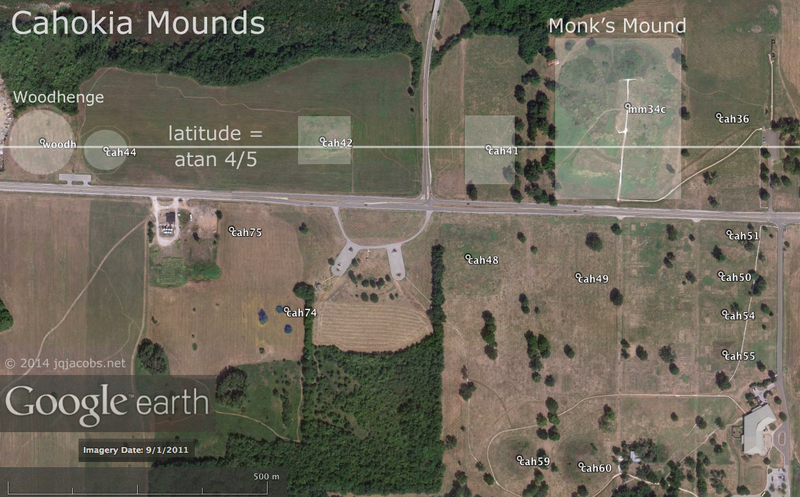 5000 BP, is one of the oldest-known, large-scale mound sites in North America. 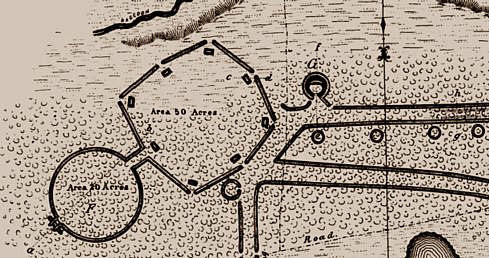 Watson Brake's dating placed mound construction in the Mississippi Valley at near 2,000 years before well-known Poverty Point, previously thought to be the earliest mound site in the United States. 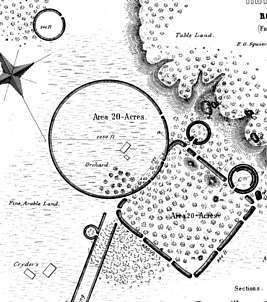 Watson Brake consists of an oval formation of 11 mounds from three to 25 feet tall connected by ridges to form an oval near 900 feet across. With Watson Brake's discovery and dating, pre-agricultural, pre-ceramic American societies were shown to be more complex than previously thought. The oldest civilization in the Americas arose along the Pacific Coast of the Central Andes, where mound construction began by 5,100 years ago. Dr. Ruth Shady Solis, et.al., (2001) published new radiocarbon dating, altering views about early Andean coastal prehistory. Shady, reported dates between 2627 BCE and 2020 BCE at Caral. New research and radiocarbon dating published in Nature demonstrates that by 3100 BCE monumental buildings were found in the Supe, Fortaleza, and Pativilca valleys, not just at Caral, indicating complex societies with a network of 20 separate major residential centers creating monumental architecture and communal buildings. Impressively large Caral, the earliest known urban center in the Americas, has a central zone containing six large pyramidal mounds surrounding a huge plaza (readily visible with Google Earth™ at -10.89125, -77.52235). 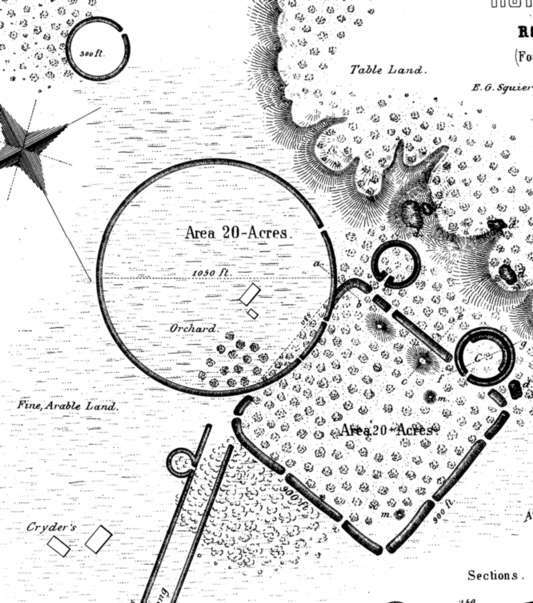 The largest mound measures 60-feet high and 450-by-500 feet at the base, plus the adjoined sunken circular plaza. Patterns evident in orientations of Initial period monument complexes, with various complexes in a valley often following the alignment of the main pyramid, suggest a practice of astronomical determination of orientations and the transfer of the orientation of the larger complexes to smaller ones. This pattern indicates an early beginning for the cosmological ordering of monuments and built space by American cultures. 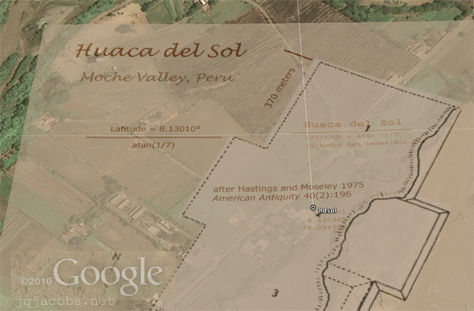 Recent study at Buena Vista evidences an early date for Andean astronomy. For thousands of years, North, Central, and South American monumental complexes arose and grew. The earthworks in Eastern North America represent a long chronology of cultures creating monuments. The rich record of earthen constructions equates to many thousands of years of history, spanning from Watson Brake and Poverty Point to large Adena mounds, to the Hopewell culture's florescence of geometic works, to numerous, diverse expressions, and to Monks Mound and the many mounds of Cahokia—the culmination in size of both earthen construction and settlement in prehistoric Eastern North America. Evidence of Socio-Political Organization and the Variation in its Interpretation. 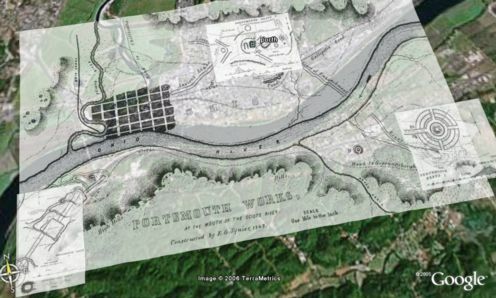 Google Earth™ Placemark Files featuring overlay site maps. Integrating photo gallery links, survey map overlays, GPS data, calculators, and code terms. 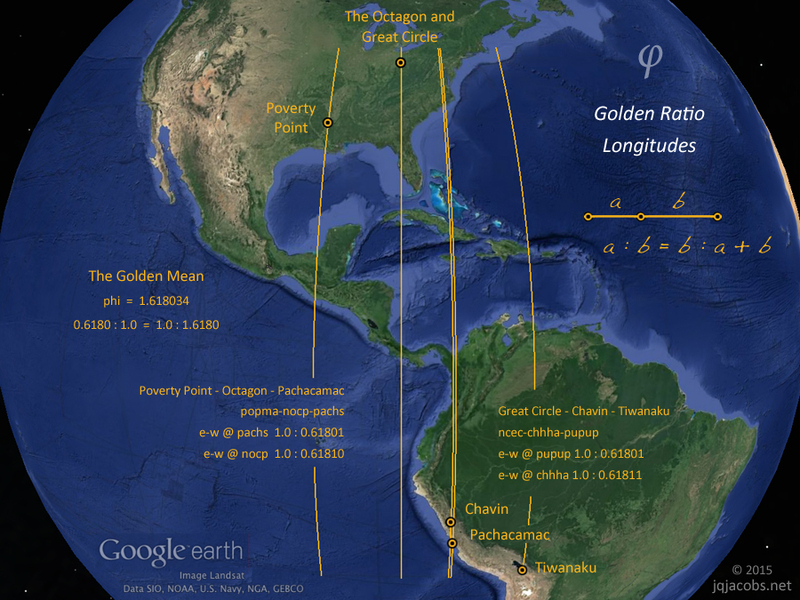 The golden mean accurately expressed by the longitudes of three major monuments. particularly the largest monuments. More details are found in the linked pages. Ames, Kenneth M. 1999 Myth of the Hunter-Gatherer Archaeology 52(5). Anderson, Jerrel C. 1980 A Recent Discovery - The Anderson Earthwork. Ohio Archaeologist 30(1):31-35. Hively, Ray, and Robert Horn 1982 Geometry and Astronomy in Prehistoric Ohio. Archaeoastronomy 4:S83-S20. Jacobs, James Q. 2000 Early Monumental Architecture on the Peruvian Coast: Evidence of Socio-Political Organization and the Variation in its Interpretation. Jacobs, James Q. 2001 Possible Geodetic Properties and Relationships of Some Monumental Earthworks in the Middle Ohio Valley, A Preliminary Inquiry. Lepper, Bradley T. 1995 Tracking Ohios Great Hopewell Road. Archaeology 48(6):52-56. Marshall, James A. 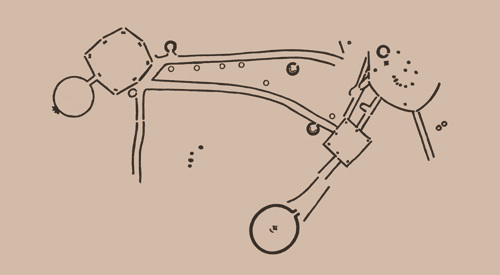 1979 Geometry of the Hopewell Earthworks. Early Man Spring:1-5. Marshall, James A. 1987 An Atlas of American Indian Geometry. Ohio Archaeologist 37(2):36-48. Marshall, James A. 1992 Azimuths of Prehistoric Circle Openings and Parallel Walls of Easter North America Examined for Astronomical Orientation. American Astronomical Society. 5 June 1992. Moorehead, Warren K. 1922 The Hopewell Mound Group of Ohio. Field Museum of Natural History Anthropological Series Volume VI, Number 5. Chicago. Morgan, William N. Prehistoric Architecture in the Eastern United States. The MIT Press, Cambridge, Mass. Romain, William F. 2000 Mysteries of the Hopewell. The University of Akron Press. Shady Solis, Ruth, Jonathan Haas, and Winifred Creamer 2001 Dating Caral, a Preceramic Site in the Supe Valley on the Central Coast of Peru. Science 292:723-726. Shepherd, Henry A. 1887 Antiquities of the State of Ohio. John C. Yorston & Co., Cincinnati. Squier, Ephriam G. and Edwin H. Davis 1847 Ancient Monuments of the Mississippi Valley. Smithsonian Institution, Washington, D. C.
Walker, Amélie A. 1998 Earliest Mound Site Archaeology 51(1). Williams Leon, C. 1980 Complejos pirámides con plaza en U, patrón arquitectónica de la costa central. Revista del Museo Nacional, Lima 41:95-110. Woodward, Susan L. and Jerry N. McDonald 1986 Indian Mounds of the Middle Ohio Valley. McDonald and Woodward, Blacksburg Virginia. 2012.01.14 - Thanks go to Doug Weller for pointing out my typo, BCE vs. BP, thus I had dated Watson Brake 2,000 years older than the actual date. ©2006 by James Q. Jacobs. All Rights Reserved. Permissions. Contact.